An unborn baby was decapitated after a Dundee doctor chose the wrong method of delivery, a tribunal has ruled. Dr Vishnavy Vilvanathan Laxman was a consultant gynaecologist at Ninewells Hospital in March 2014 when the tragedy occurred. The medical tribunal ruled that Dr Laxman took the decision not to perform an emergency caesarean but instead opted for a regular delivery. 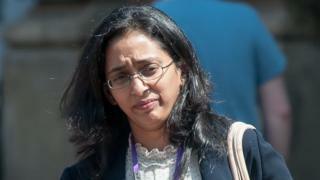 Dr Laxman faces being struck off as a result of her actions. The Medical Practitioners Tribunal Service panel ruled that Dr Laxman's decision "set in train a course of events" which resulted in the decapitation of the premature baby "and to this extent contributed to that decapitation." The tribunal noted: "But for Dr Vilvanathan Laxman's error of judgement in this regard, the decapitation would not have occurred." The tribunal was told that Dr Laxman was nearing the end of a 24-hour split shift at the maternity unit when she was called to a 30-year old-woman who had been admitted to hospital while 25 weeks pregnant. The tribunal was told that Dr Laxman proceeded with a vaginal delivery of the baby when the mother's cervix was dilated by no more than 4cm and the baby was in the breech position. The tribunal was told that the baby was decapitated during the attempted delivery. It noted: "The tribunal was in no doubt that throughout Dr Vilvanathan Laxman's involvement in the attempted delivery of Baby B, she was endeavouring to achieve the best outcome for Patient A and Baby B. "However, the central issue in this case is whether Dr Vilvanathan Laxman's decision to attempt a vaginal delivery of Baby B rather than an immediate caesarean section under general anaesthetic was clinically indicated or whether the only proper course in the circumstances would have been to proceed to an immediate caesarean section. "In the tribunal's judgement it was Dr Vilvanathan Laxman's decision in this regard that was to dictate her subsequent actions and the course of events which ultimately led to Baby B being decapitated." Dr Laxman qualified in 1999 in Chennai, India before coming to the UK in 2004 where she carried out roles in obstetrics and gynaecology in Stirling, Kirkcaldy and Dundee. An NHS Tayside spokeswoman said "Dr Laxman is no longer employed by NHS Tayside. "We have very robust processes and procedures in place when any serious or major adverse event occurs to ensure any learning is captured and improvements made.